Little Tokyo UnBlogged: API Marriage Equality in Little Tokyo! 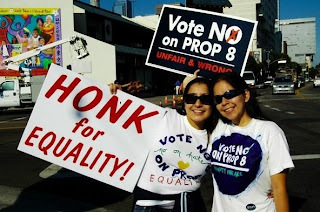 Last Thursday morning on my way to work, I was driving down First Street in Little Tokyo and I saw a bunch of people in red shirts with signs saying, "Honk for Equality!" 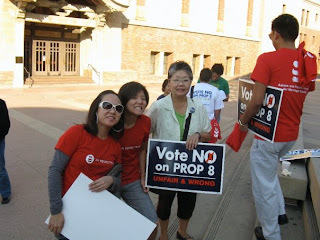 I then remembered that that morning, there had been a press conference organized by API Equality-LA (Asian Pacific Islanders for Marriage Equality) at the Japanese American National Museum to help defeat Proposition 8 on November 4th. So I found myself honking all the way down First Street with a big smile on my face. 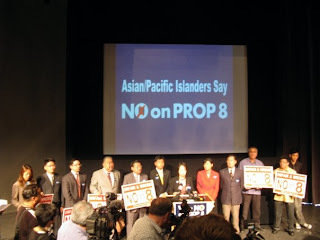 Asian & Pacific Islander community leaders coming together to defeat Proposition 8: Warren Furutani, John Chiang, Judy Chu, Dennis Arguelles, Hamid Khan, George Takei, John Cho, and others. 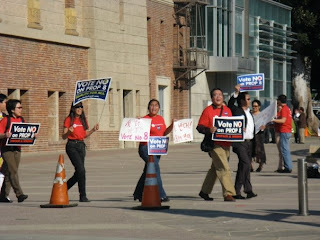 Thanks to Veronica Garcia Macias for the great photos. Don't forget to vote Tuesday, November 4th!